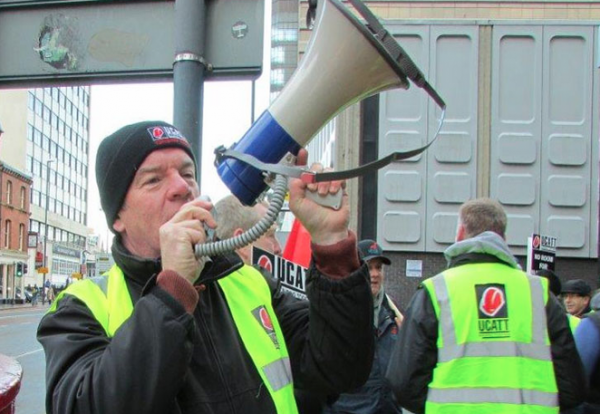 Construction union Ucatt claim a blacklist protester was hospitalised after a confrontation with security guards in Leeds today. The incident occurred at the Merrion Centre in Leeds where Sir Robert McAlpine has an offfice. The protesters were demonstrating as part of the TUC Day of Action on blacklisting. The union said demonstrators had obeyed all the instructions to protest outside the building. But trouble occurred when some of the protesters were invited inside the building to visit the PCS union which also has an office inside the Merrion Centre. Security barred anyone from entering the building and it is claimed that several of the protesters were assaulted with one hopitalised. Rob Morris, Regional Secretary of UCATT Yorkshire, said: “This was an appalling incident and was totally unnecessary.